The use of a pendulum to seek guidance is a tool that has been used over 200 years old. It is said that using this psychic tool, taps into your higher self, your intuition & your subconscious mind. Anyone can utilize this easy tool! It is a fantastic way to gain possible and almost insight, to guide you in pretty much any situation. 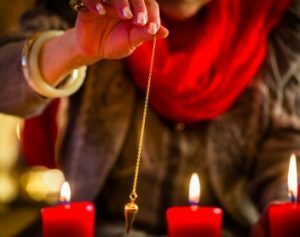 When you think of a pendulum, your mind likely wanders to the very pretty, very elaborate pendulums that many psychics use. Beautiful crystals at the end of elegant chains. While this is the case for many commercially available pendulums and the energies of the crystals may aid the guidance, they honestly don’t have to be quite so fancy. Pendulums can be anything that can be attached to a fixed support (a chain, shoe lace, a thread of wool), to allow it to swing. You may therefore use a favourite necklace with a pendant, or even thread an old ring with a piece of string. A conker on a shoelace is also an excellent alternative to a shop bought choice. At a pinch I have even personally used my earphones as a pendulum on the go. This should give you some ideas for creating a tool that’s bespoke to your needs. Get creative! Pendulums will behave a little differently for each person. After all, it is is an extension of you and no two people are alike. However, here are a couple of tried and tested ways to get into the swing of things. The first is to ask it a series of yes/no questions you know the answer to. This will give you a sense how it will move to indicate Yes and No. Example; Is my name ________? My pendulum swings in a vertical fashion, to indicate that “Yes” my name is _________. Example: Is my name _____? My pendulum swings in a horizontal motion, to indication that “No” my name is not ________. You can purchase or create a pendulum mat. Pendulum mats look a little bit like a compass, they will include the Yes and No directions as well as a few other variables. If creating your own mat, you can include answers that resonate with you that may not be included on a traditional mat. Speak to your pendulum. Ask it to show you how it would like to move for the different answers. Example; Pendulum, show me “Try Again”. Do this over & over again, until you are confident you recognise the movements & the feel of the energy for each answer. 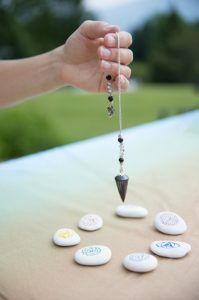 Pendulums are quite a versatile tool and another great way that you can use them, is to link in with the energy of a situation. A good starting exercise for this is, in the morning, write down the name of the day or the present date. Quiet your mind and hold your pendulum over your writing. Pay close attention to how it moves. Generally speaking, if there is a lot of movement it means that your day will be wonderful, very fast paced and a lot of really good energy. If there is little or no movement it may mean that your day won’t go according to plan or that something needs extra attention. Once you’re confident in doing this daily, you can try it with other situations. 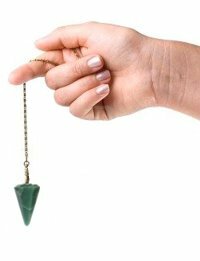 Whether you have a fancy crystal pendulum or use an old USB cable with a pen stuck on the end, the pendulum can be an insightful and fun tool to use. I hope you enjoy creating your pendulums and using as much as I do.